MEAN Labour types in Camden would snarl that the borough’s Tories couldn’t organise a piss-up in a brewery. Well, they don’t need to, they’ve already organised one in a library. 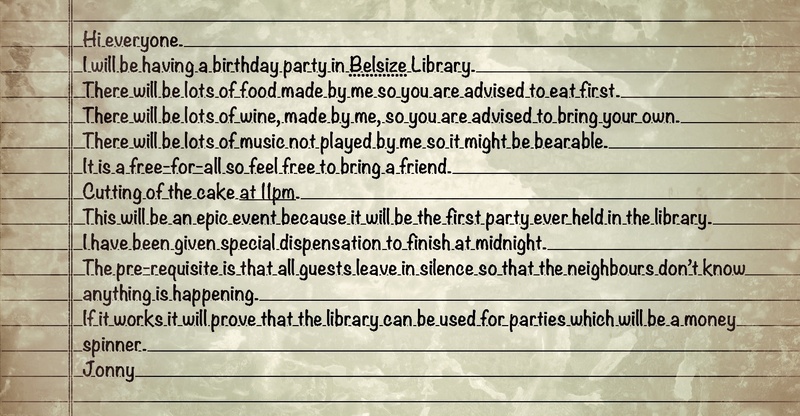 Belsize Library to be precise, and all to celebrate amiable local councillor Jonny Bucknell’s upcoming birthday. He has sent out invites (see below) this week explaining that if everybody could leave his party quietly at midnight, then the building, now run independently from council control, might be the scene of further parties. And that’ll be a “money-spinner”. Invitees receiving Jonny’s emailed note, however, are also warned to tread carefully with his home made food and wine. Maybe he should order in some of Flick Rea’s famous “port wine jelly”. Many happy returns, JB. Libraries can be soo very conservative friendly ….. no wonder they are getting shut down ! The library’s a stone’s throw away from the local food bank, but the big question is whether Cllr Bucknell will be popping in for a guided tour of the new facility. Judging by Cllr Bucknell’s remarks at the last Full Council meeting – “You show me anybody who is suffering any hardship in Camden and I’ll personally lobby IDS” – it would seem that a friendly, but informative visit is just a little overdue!!!!! !